“Design is everything!” “Everything revolves around a good design!” “The best, most functional, long-lasting projects start with a great plan” – All comments by Chris Griffin, owner of Unique Landscapes & Unique Custom Pools, LLC., and one of the Arizona’s most experienced landscape and pool designers. Those comments are the foundation for Unique Companies – and our primary company objective. 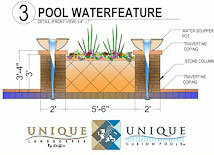 An example of how a properly designed water feature can turn a pool into a backyard oasis. Although most of our clients have ideas on what they want, we still emphasize the importance of how we can inject our experience into any concept, making it a good design. There are many variables that factor into the “best” design, all of which require communication, education & collaboration with our client. CLIENTS ARE FROM MARS, DESIGNERS ARE FROM VENUS. AT UNIQUE, WE ALIGN THE PLANETS. Communication is important so that the designer can understand all that is desired by the client. A good designer should be able to listen and understand the client’s needs & desires, family & lifestyle, finances & budget, and overall project fears & concerns. Unique’s designers are just that…Unique. We understand what you’re trying to say, not just what you are saying. Our goal is to give you want you want in your design, then WOW you with some fine-tuned touches you haven’t thought of yourself. Collaboration is the key to the pool & landscape design of your dreams. Education is our method of informing the client what we know as designers. As designers, it is important to educate our clients on what is available, current trends, and other ideas that they may have not considered for their project. Unique Companies handles so many aspects of construction, we are always learning – but, for the most part, we know the best long-term way of installing everything we offer. Collaboration is the “dialogue” between clients and designer that accomplishes the best designs. Most customers are used to “monologue” from designers, and never really get a design that fits YOU. It is virtually impossible for any designer to create the “perfect backyard” or “best pool design” without the collaboration process. Our ideas, coupled with your ideas, are how YOUR dream backyard is created. 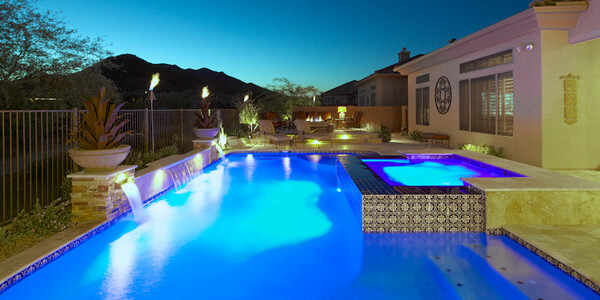 Every project is different, every project is UNIQUE, and we are experienced in handling all aspects of landscape and pool design in Arizona. The purpose of a pool cartridge filter is to clean your pool water by capturing debris and decontaminates in the folds of the filter. With time these folds will become clogged, water will not flow thru the filter as easily, and pressure within the filter will increase. Operationally, with water flow down, you will not be turning your pool water as frequently and your pool decontaminates will start to build up. It’s time to clean your filter. As a general rule of thumb, your filter should be clean at least once a month during the summer and every other month if your pool is operational during the winter. Instead of spending countless hours and hundreds of gallons of water to clean your pool filters -visit FilterClean. Bring your pool filter cartridges directly to them and in about 30 minutes they will clean them for you! They will also replace any broken bands, which will help extend the life of your filters for no additional fee. Best of all their entire service is a fraction of the cost, plus it saves you tons of water and your precious time. You can even drop off your filters and pick them up later to save you even more time. They are centrally located in Tempe for your convenience. They also sell New Filters. 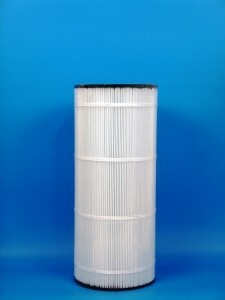 Next time your filters need replacing call or visit their online store at FilterClean. Conveniently located in Tempe- Simply bring in your pool filter cartridges and we will have them cleaned and rebanded in 45 minutes or less using our Unique Deep-Cleaning System. FilterClean’s one-of-a-kind, unique, computer controlled filter cleaning system was three years in development. FilterClean uses no chemicals, other than water balancing chemicals (the same chemicals you use to keep your pool water sparkling clean and free of algae), to clean your filters. FilterClean recycles all of the water used in the process. All you need to do is remove your pool filter cartridges from your pool filter according to the manufacturer’s instructions. Place the filter cartridges in plastic bags to keep them from leaking water all over your vehicle. Bring the filter cartridges to FilterClean and we will do the rest in as little as 15 to 45 minutes.